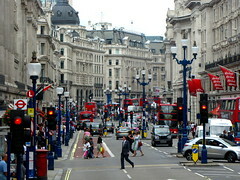 If you’re moving to London, England or have visited before, you may already be familiar with some of west London’s well-renowned streets: Oxford Street, Regent Street, Bond Street, Knightsbridge, and of course the Piccadilly Circus are all shopping, dining, and entertainment hot-spots for locals and tourists alike. What I’ve come to appreciate since my own international relocation to London, however, is the discovery of side streets just off those major ones. Among locals, they’re perhaps just as popular for night-time outings if not more once the crowded bustle of the main streets gets old. Other side streets, on the other hand, are more surprisingly quiet and residential—you’d never guess that they could exist so close to the action; truly the best of both worlds if you can score a London apartment there! Well, one popular spot right off Regent Street is Carnaby Street, a cute little network of streets filled with shops and restaurants that you can find just through the archway of Liberty department store, another destination in itself well worth stepping off Regent or Oxford streets for. Just south of this area past Beak Street you enter another nice and hidden spot for grabbing a libation or contemporary cuisine: if you’re exiting the Piccadilly Circus tube station, instead of circumnavigating the Circus or spinning off onto Regent Street, try cutting up Glasshouse Street instead to Warwick Street or Brewer Street. I personally recommend Nopi restaurant on Warwick Street (where I just had a most delicious lunch last weekend) and Mark’s Bar on Brewer Street (hint: there’s no street sign for this intimate bar, so enter the HIX restaurant and head downstairs right inside the door). Tucked away just northeast of the intersection of Warwick and Brewer is Golden Square, which was a recent residential discovery of mine—its peacefulness blew me away, as it’s a truly lovely and upscale square surrounded by London apartments, cafés, galleries, and boutiques (I’m personally very curious to return just to visit the Nordic Bakery there). Join me in my next post as we hop across to the west side of Regent Street and pop up just north of Oxford Street. You just might be inspired to ask your London Relocation agent to find you an apartment to rent near these areas!